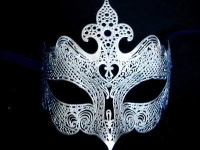 Conveying a beautiful and heartfelt meaning to any party, this beautiful Rugiada Filigree Mask for women is one of the hottest trends this season. 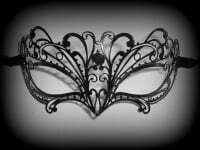 A swish style which has been seen at masquerade balls all over the world, this gorgeous nero gloss black laser cut filigree mask is all curves in a freestyle design which is adorned with authentic Swarovski crystals to finish the look. 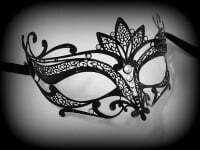 Elegant & feminine with soft traditional black ties, this gorgeous mask gives a sophisticated edge to the trend for metal masks and will look great worn with you best party outfit. A must-have for its stunning design as well as its versatility.